Zimmerman pine moth can be effectively controlled at this time of year. They are susceptible now in southern and central Illinois and will become susceptible to control at the end of August in northern Illinois. This insect commonly attacks at branch whorls of Scotch, Austrian, red, and other pines. 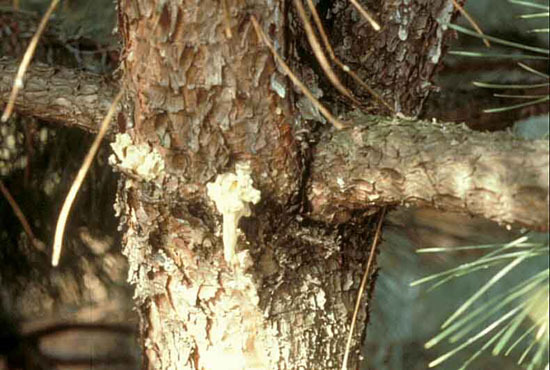 On white pine, it is found more commonly in the tips of branches, causing dieback and a proliferation of shoots due to secondary bud break. Identification of attacked trees is by the appearance of masses of white pitch on the trunk near the base of one or more branches. This sap exudes from wounds made by the caterpillars tunneling under the bark and through the trunk. Damage can be severe enough to girdle and kill major branches on young trees. However, several years of these moth borers tunneling into the trunk can weaken it, causing the trunk to snap off a few feet above the ground. The tree is usually not killed by this occurrence. Instead, several buds break at this location, resulting in a multi-trunked tree that eventually matures into a much shorter, broader tree than those that are not attacked. During the summer, the mature, brown, 1-inch long caterpillars pupate under masses of pitch on the trunk. They emerge as gray moths that are about 1/2 inch long. This emergence occurs from about mid-July in southern Illinois to early August in northern Illinois. 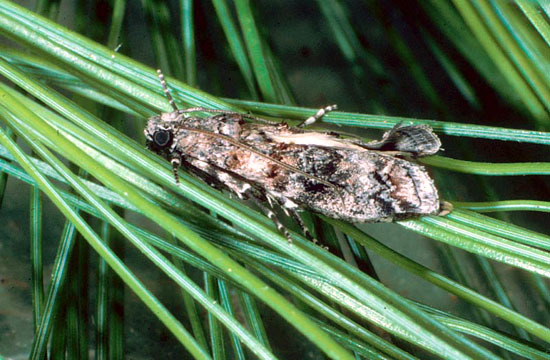 After mating, the moths lay their eggs on pine trees. Apparently, the moths do not fly very high because damage rarely occurs more than 6 feet up the tree. As a result, only younger, smaller trees are susceptible to serious damage. These eggs hatch into tiny caterpillars that wander over the bark for several weeks in the fall before each overwinters under a mass of silk called a hibernaculum. The hibernaculum is typically spun by the caterpillar under a bark flake. In the spring, these tiny caterpillars emerge from their hibernacula and wander again over the bark for several days before tunneling under the bark. The exposed caterpillars are susceptible to being killed on contact by insecticides during the fall and spring. Once the caterpillars bore into the tree, they are not susceptible to control. Permethrin (Astro) applied to the bark anytime during the next month or so is effective in controlling the newly hatched caterpillars.